First whisk the whites — they should be at room temperature. Once proteins foamy, add a pinch of salt and citric acid, continuing to whisk. To stabilize the protein, add a little fine sugar (total). Whisk until resistant foam. In another bowl, beat egg yolks with remaining sugar until white. Add sifted flour with baking powder, three tablespoons of hot water. Whisk. Should get sticky texture of the dough. It introduced small portions beaten egg whites, knead it gently each time folding gently. 2. The dough is put into a form with parchment paper and make. If the form with non-stick coating, no grease. 3. Bake in a pre heated to 180 degrees oven for 25-30 minutes, then low down the temperature to 140 degrees and bake for another 10-15 minutes. Guided by the oven. Baking time and temperature adjust. 4. The finished cake refrigerated for some time directly in the form, even upside down (the cake doesn’t fall out), then hold the knife around the circumference of the shape, it is taken out and cooled on a rack. 5. Prepare the soufflé filling. Grate the zest from one lemon, squeeze the juice. 6. Separate the egg whites and yolks. The RUB the yolks with the flour, add a little warm milk and all mix well to avoid lumps. 7. Milk-yolk mixture is put in a water bath so that the container does not touch the water, and cook until thick, stirring constantly. Make sure that there are no lumps! If the mixture is not completely smooth, then RUB it through a sieve, helping spoon. Custard mixture cool to room temperature. 8. Proteins at room temperature, beat with a pinch of salt. As soon as a stable foam, add 2-3 tbsp malkoha sugar (from the total quantity for the filling), continuing to whisk until the sugar dissolves. Butter room temperature, whisk the remaining sugar. Continuing to whisk, add the custard mixture. 9. Prepared gelatin mix with lemon juice and slowly injected into the oil procurement, there enter the beaten egg whites. Add peels. Stir with a mixer on medium speed. 10. 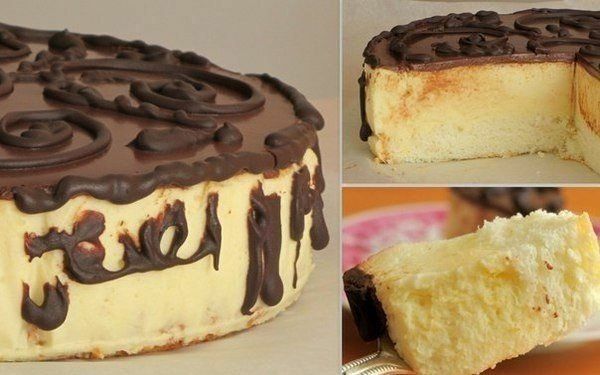 To assemble the cake: take the same form in which it was baked biscuit. At the bottom of the form put parchment paper that is larger than the diameter of the form. The bottom of the mould is compacted paper. Put the pastry in the bottom of the form. Pour the souffle cake and put in refrigerator until firm.Souffle grasped quickly. But we need to be patient and wait for complete drying, to apply a glaze. 11. Until souffle is set, prepare the glaze. Cream, finely broken chocolate warmed on a water bath. All mix well and if needed, add more cream is supposed to be watery glaze that you pour over the cake. 12. Take out the cake from the refrigerator and pour the slightly cooled glaze already frozen souffle. Even out the glaze, turning the form. Put in the fridge. Or how about a little beauty frosting to draw patterns on the cake.